Lionel Brockman Richie Jr. (born June 20, 1949) is an American singer, songwriter, actor and record producer. Richie's style of ballads with the Commodores and in his solo career launched him as one of the most successful balladeers of the 1980s. Beginning in 1968, Richie was a member of the funk and soul band the Commodores. The Commodores became established as a popular soul group; their first several albums had a danceable, funky sound, as in such tracks as "Machine Gun" and "Brick House." Over time, Richie wrote and sang more romantic, easy-listening ballads such as "Easy", "Three Times a Lady", "Still", and the breakup ballad "Sail On". Richie launched a solo career in 1982 and his 1982 debut solo album, Lionel Richie, contained three hit singles: the Grammy winning U.S. number-one song "Truly", and the top five hits "You Are" and "My Love". The album hit No. 3 on the music charts and sold over 4 million copies. His 1983 follow-up album, Can't Slow Down, sold over twice as many copies and won the Grammy Award for Album of the Year, propelling him into the first rank of international superstars. He also co-wrote the 1985 charity single "We Are the World" with Michael Jackson, which sold over 20 million copies. Over the course of his musical career, Richie has sold over 90 million records worldwide, making him one of the world's best-selling artists of all time. He has won four Grammy Awards including Song of the Year in 1985 for "We Are the World" which he co-wrote with Michael Jackson, Album of the Year in 1984 for Can't Slow Down, Producer of the Year (Non-Classical) in 1984 and Best Male Pop Vocal Performance for "Truly" in 1982. Richie has also been nominated for two Golden Globe awards and won one. In 1982 he was nominated for Best Original Song for the film Endless Love. In 1986 he was nominated for and won the Golden Globe award for Best Original Song for "Say You, Say Me", featured in the film White Nights. The song also won the Academy Award for Best Original Song. In 2016, Richie received the Songwriters Hall of Fame's highest honor, the Johnny Mercer Award. Richie was born and raised in Tuskegee, Alabama, the son of Lionel Brockman Richie Sr. and Alberta R. Foster He grew up on the campus of Tuskegee Institute. He graduated from Joliet Township High School, East Campus, in Joliet, Illinois. A star tennis player in Joliet, he accepted a tennis scholarship to attend Tuskegee Institute, and graduated with a Bachelor of Science degree in economics. Richie seriously considered studying divinity to become a priest in the Episcopal Church, but ultimately decided he was not "priest material" and decided to continue his musical career. He is a member of Kappa Kappa Psi, a national honor fraternity for band members, and an active life member of Alpha Phi Alpha fraternity. As a student in Tuskegee, Richie formed a succession of R&B groups in the mid-1960s. In 1968, he became a singer and saxophonist with the Commodores. They signed a recording contract with Atlantic Records in 1968 for one record before moving on to Motown Records initially as a support act to The Jackson 5. The Commodores then became established as a popular soul group. Their first several albums had a danceable, funky sound, as in such tracks as "Machine Gun" and "Brick House." Over time, Richie wrote and sang more romantic, easy-listening ballads such as "Easy", "Three Times a Lady", "Still", and the breakup ballad "Sail On". By the late 1970s, Richie had begun to accept songwriting commissions from other artists. He composed "Lady" for Kenny Rogers, which hit No. 1 in 1980, and produced Rogers' album Share Your Love the following year. Richie and Rogers maintained a strong friendship in later years. Latin jazz composer and salsa romantica pioneer La Palabra enjoyed international success with his cover of "Lady," which was played at Latin dance clubs. Also in 1981 Richie sang the theme song for the film Endless Love, a duet with Diana Ross. Issued as a single, the song topped the Canada, Brazil, Australia, Japan, New Zealand and US pop music charts, and became one of Motown's biggest hits. Its success encouraged Richie to branch out into a full-fledged solo career in 1982. He was replaced as lead singer for the Commodores by Skyler Jett in 1983. 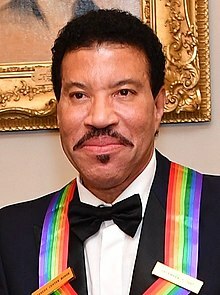 Richie's 1982 debut solo album, Lionel Richie, contained three hit singles: the U.S. number-one song "Truly", which continued the style of his ballads with the Commodores and launched his career as one of the most successful balladeers of the 1980s, and the top five hits "You Are" and "My Love". The album hit No. 3 on the music charts and sold over 4 million copies. His 1983 follow-up album, Can't Slow Down, sold over twice as many copies and won two Grammy Awards, including Album of the Year, propelling him into the first rank of international superstars. The album contained the number-one hit "All Night Long" a Caribbean-flavored dance number that was promoted by a colorful music video produced by former Monkee Michael Nesmith. In 1984, Richie performed "All Night Long" at the closing ceremony of the XXIII Olympic Games in Los Angeles. Several more Top 10 hits followed, the most successful of which was the ballad "Hello" (1984), a sentimental love song that showed how far Richie had moved from his R&B roots. Richie had three more top ten hits in 1984, "Stuck on You" (#3), "Running with the Night" (#7) and "Penny Lover" (#8), as well as writing & producing "Missing You" for former labelmate and duet partner Diana Ross (#10 Pop, #1 R&B). In 1985, Richie wrote and performed "Say You, Say Me" for the film White Nights. The song won an Oscar for his efforts and reached No. 1 on the U.S. charts, staying there for four weeks, making it the number-two song of 1986 according to Billboard's Year-End Hot 100 chart, behind the charity single "That's What Friends Are For" by Dionne and Friends. He also collaborated with Michael Jackson on the charity single "We Are the World" by USA for Africa, another number-one hit. In 1986, Richie released Dancing on the Ceiling, his last widely popular album, which produced a run of five US and UK hits, "Say You, Say Me" (U.S. #1), "Dancing on the Ceiling" (U.S. #2), "Love Will Conquer All" (U.S. #9), "Ballerina Girl" (U.S. #7), and "Se La" (U.S. #20). He made his return to recording and performing following the release of his first greatest-hits collection, Back to Front, in 1992. Richie was the headliner at a 2006 Fourth of July tribute concert with Fantasia Barrino at the Philadelphia Museum of Art. On May 7, 2006, Richie performed on the main stage (Acura Stage) at the New Orleans Jazz & Heritage Festival, replacing Antoine "Fats" Domino, who had fallen ill. Richie released his eighth studio album titled "Coming Home" on September 12, 2006. The first single of the album was "I Call It Love" and was premiered in July 2006, becoming his biggest hit in the U.S. in ten years. The album was a big success for Richie in the United States, peaking at No. 6. On December 9, 2006, Richie hosted and performed live on the British television show An Audience with Lionel Richie. Two months later, he performed "Hello" on the 49th Grammy Awards show. On May 2, 2008, Richie was the 21st recipient of the George and Ira Gershwin Lifetime Achievement Award at UCLA's annual Spring Sing. In accepting the award, Richie said: "Forget about surviving 30 some odd years in the music business, Lionel Richie survived 27 years of Nicole Richie." On December 31, 2008, Richie performed in Times Square for the New Year's Eve celebration and ball drop. He also performed on the 2009 season finale for American Idol with Danny Gokey. In May 2009, he announced that he would like to get The Commodores back together soon, "or in the next 10 years no one will care." An album, Just Go, was released in 2009. On July 7, 2009, Richie performed "Jesus is Love" at Michael Jackson's memorial service. Richie returned to Australia in 2011 where he and guest artist Guy Sebastian toured the country and New Zealand with concert dates throughout March and April. 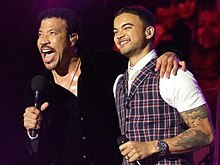 Richie and Guy Sebastian have recorded Richie's 1983 number 1 single "All Night Long" together, to raise money for Australian floods and New Zealand earthquake relief. Richie handpicked Sebastian to support him in Australia and the pair will perform the song together at each concert. On March 26, 2012, Richie released his tenth studio album, Tuskegee. It features 13 of his hit songs performed as duets with country stars including Sugarland's Jennifer Nettles, Jason Aldean, Tim McGraw, Blake Shelton, Darius Rucker, Rascal Flatts, Kenny Chesney, Billy Currington, Little Big Town, Shania Twain, Kenny Rogers, Willie Nelson, and Jimmy Buffett. In an interview with American Songwriter magazine, Richie stated "I'm just gonna stand next to them again with great country artists and hug them." After years of mediocre sales in the U.S., the album returned him to the top of the Billboard 200 chart, his first number one album there for more than 25 years, and achieved Platinum status within six weeks of release. On June 7, 2013, Richie announced on NBC's The Today Show that he would launch "All the Hits All Night Long", his first North American tour in over a decade. The tour began on September 18 in Hollywood, Florida, and ended on October 18 in Los Angeles, California. Also in June 2013, Richie appeared in a television commercial for the Lion Nathan alcohol company to promote the "Tap King" draught beer product. Richie reportedly received A$1.5 million to appear in the promotional campaign that depicts the musician singing "Hello" at a piano, while the device rests on top of the instrument. On June 28, 2015, Richie played to an appreciative[clarification needed] 100,000–120,000 audience at the Glastonbury Festival, England. His show was described as "triumphant" by the BBC and was followed by his return to the top of the UK albums chart with a reissued compilation album of his work as both a solo artist and with the Commodores. In September 2017, ABC announced that Richie would be a judge for the revival of American Idol. In May 2017, Lionel Richie was honored at Berklee College of Music during the 2017 Commencement Concert where graduating students performed a medley of his discography. Richie was also awarded an Honorary Doctorate of Music. On December 3, 2017, Lionel Richie received the Kennedy Center Honors. In recent years,[when?] Richie has become a phenomenon[clarification needed] in various Arab states, and has performed in Morocco, United Arab Emirates, Egypt, and Libya. John Berman for ABC News reported in 2006 that "Grown Iraqi men get misty-eyed by the mere mention of his name. 'I love Lionel Richie,' they say. They can sing an entire Lionel Richie song." Berman wrote that Richie said he was told that Iraqi civilians were playing "All Night Long" the night U.S. tanks invaded Baghdad. Richie was against the war and has said he would like to perform in Baghdad someday. On October 18, 1975, Richie married his college sweetheart, Brenda Harvey. In 1983 the couple informally adopted Nicole Camille Escovedo, the two-year-old daughter of one of the members of Lionel's band, and niece of drummer Sheila E. They raised her as their daughter, Nicole Richie, and adopted her legally when she was nine years old. In 1986, while still married to Harvey, Richie began a relationship with Diane Alexander. He would later separate from Harvey, who in 1988 allegedly discovered Richie and Alexander together in a Beverly Hills hotel room by saying she was "room service." In June 1988, Harvey was arrested and charged with corporal injury to a spouse, resisting arrest, trespassing, vandalism, battery, and disturbing the peace after she found Richie at Alexander's Beverly Hills apartment. Richie and Harvey divorced on August 9, 1993 after nearly 18 years of marriage. Richie married Diane Alexander on December 21, 1995. They have a son, Miles Brockman (born May 27, 1994), and a daughter, Sofia Richie (born August 24, 1998). The marriage ended in 2003. Richie became a grandfather in 2008 when Nicole Richie gave birth to a baby girl with the lead singer of Good Charlotte, Joel Madden. Richie's second grandchild was born to the couple in 2009. Richie was baptized and grew up Episcopalian. He considered becoming an Episcopal priest instead of taking up a career in music. Richie was the first person to receive an RIAA diamond album award. ^ "Monitor". Entertainment Weekly (1212). June 22, 2012. p. 24. ^ Leopold, Todd (January 28, 2015). "'We Are the World' at 30: Where are they now?". CNN. Retrieved January 8, 2017. ^ a b "Lionel Richie : Grammy Awards". Grammy Awards. Retrieved July 24, 2014. ^ a b "Lionel Richie : Golden Globe Awards". Golden Globes. Archived from the original on October 6, 2014. Retrieved July 24, 2014. ^ Rothman, Michael (June 10, 2016). "Lionel Richie, Chic's Nile Rodgers and More Enter Songwriters Hall of Fame". ABC News. Retrieved January 8, 2017. ^ Huey, Steve. "Lionel Richie Biography". Allmusic. Retrieved March 4, 2011. ^ a b Jessica Lacher-Feldman. "Lionel Richie." Encyclopedia of Alabama. Published on July 2, 2010. Updated on January 16, 2017. Retrieved on February 15, 2018. ^ "My Life in Pictures Lionel Richie". people. Retrieved March 20, 2019. ^ Fussman, Cal (March 22, 2012). "Lionel Richie: What I've Learned". Esquire. Retrieved February 9, 2015. ^ "Prominent Members of Kappa Kappa Psi". kkpsi.org. Archived from the original on July 16, 2011. Retrieved March 17, 2012. ^ a b c d "Biography – Lionel Richie". imdb.com. Retrieved July 26, 2007. ^ "Alpha Phi Alpha Fraternity". Psuchronicles.com. October 5, 2011. Retrieved March 17, 2012. ^ "Richie accepts Gershwin Award". Newsroom.UCLA.edu. May 2, 2008. Archived from the original on September 27, 2011. Retrieved May 24, 2011. ^ Graff, Gary (May 18, 2009). "Lionel Richie Ready to Go With Albums, Tour, Commodores Reunion". Billboard. Retrieved August 24, 2009. ^ "Looking back at Michael Jackson's memorial". Orange County Register. July 7, 2009. Retrieved January 10, 2019. ^ "Lionel Richie to play GF replay". September 29, 2010. Archived from the original on October 1, 2010. ^ Cameron Adams, . "Lionel Richie and Guy Sebastian have teamed up to record a charity single for earthquake relief", Daily Telegraph, Sydney, February 26, 2011. ^ Paul Cashmere, "Guy Sebastian and Lionel Richie work All Night Long for flood relief" Archived April 3, 2012, at the Wayback Machine. Undercover, February 24, 2011. Retrieved February 27, 2011. ^ Evan Schlansky (March 23, 2012). "Reinventing Lionel Richie". American Songwriter. Retrieved April 12, 2012. ^ "Lionel Richie Announces 2013 North American Tour". ConcertBoom. Archived from the original on October 19, 2013. Retrieved June 14, 2013. ^ Duff, Eamonn (June 27, 2013). "Lionel Richie's cash splash in beer commercial". Sydney Morning Herald. Retrieved October 10, 2013. ^ "Lionel Richie storms album chart". BBC News. July 5, 2015. Retrieved July 5, 2015. ^ "Lucinda Williams Receives Honorary Doctorate From Berklee". The Boot. Retrieved December 19, 2017. ^ ConcertFix. "Lionel Richie Tour Dates & Concert Tickets 2019". ConcertFix. Retrieved March 26, 2019. ^ "Lionel Richie: The Key to Peace in the Middle East". NPR. December 4, 2006. Retrieved June 12, 2007. ^ "Richie Beloved in Iraq". June 2, 2006. ^ a b John Berman. "Baghdad's Lionel Richie Obsession". ABC News. Retrieved June 12, 2007. ^ "Summertime, and the Loving Is Anything but Easy for Lionel, Melvin and Stephanie". People. 30 (3). July 18, 1988. ^ Spelling of name found on the California Birth Index 1905–1995, under RICHIE, MILES BROCKMAN, on May 27, 1994 in Los Angeles County. ^ "Most Expensive Celeb Divorces > Lionel & Diane Richie". (slideshow) E! Online (NBC Universal). Retrieved August 14, 2016. ^ Jessica Herndon (September 13, 2009). "Lionel Richie: 'Sparrow Looks Just Like Harlow'". People. Retrieved April 4, 2013. ^ a b Hodapp, Christopher L. (March 5, 2011). "Lionel Ritchie and the Knights of Wise Men". Freemasons for Dummies. Retrieved November 6, 2015. ^ "Lionel Richie Doesn't Know How to Read or Write Music?". USMagazine.com. Retrieved September 18, 2017. ^ "Easy like Lionel Richie". harvard. Retrieved March 20, 2019. ^ "Lionel Richie Charity Work". LookToTheStars.org. Retrieved March 17, 2012. ^ "Gold & Platinum". RIAA.com. Retrieved December 6, 2018. Wikimedia Commons has media related to Lionel Richie.